Going on a hike should be a relaxing, invigorating experience. Yet, if you don’t take the necessary precautions, you can get yourself and your hiking partners into serious trouble. When I speak about hiking safety, I never want to scare you away from hiking. Just use these few simple and safe practices while you are out enjoying nature on the trails to make sure you come home safe. You may recognize these as part of the “ten essentials” of safe hiking. It seems that every “ten essentials” list is slightly different, or is geared toward a specific region. Here, I’ve tried to just make it as simple as possible for anyone in anyplace. By the way, I’ve also provided links to products of interest that may help you find what you need faster! Get together these things and just keep them in your pack and you won’t ever be without them. Just remember that if you use something from your first aid kit or some matches, replenish them before you go out next time. An emergency blanket can save your life if you get stranded, is super cheap and can often be bought in packs of 10 . If you like using topographic maps, a compass can come in handy to orientate yourself in the wild. If not, either bring a GPS, or get a nice GPS app on your smart phone and take the time to learn to use it. I currently use Route Scout, a free app available for Android and iPhone. In case you didn’t know, you need water to survive. When you’re out for a hike, you sweat and need to replenish that water, or risk dehydration and all those life-threatening heat-related illnesses that come after. 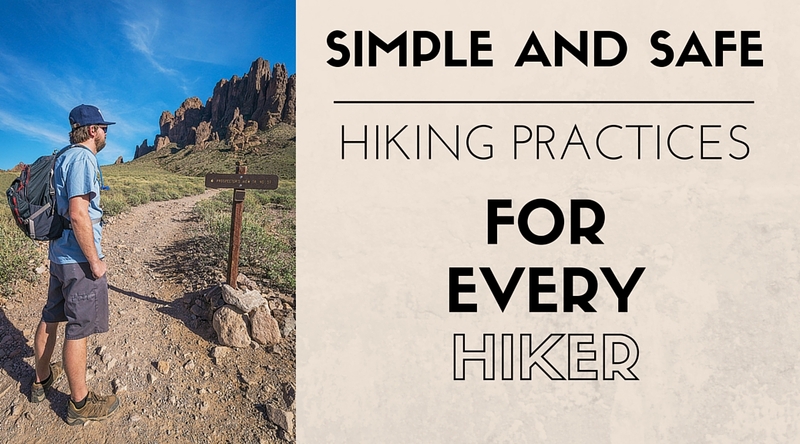 Every person on the hike should carry their own water, and bring more than you think you need. It’s better to finish with extra water than run out and get into trouble. A good rule of thumb is to bring one liter for every 4 miles you walk, and one liter for every 1,000 feet of elevation you climb. Substitute “quart” for “liter” if you don’t like talking in metric. Even on short hike, be sure to take some water just in case, especially on hot summer days. Remember to drink your water, even if the water gets warm, because it won’t do you any good just sitting in your pack the whole time. Depending on the length of your hike, you have to determine how much food you want to bring, but always bring a little extra in case your hike lasts longer than you expected. A short hike may require just a couple snacks, an all-day mountain climb may require a bunch of snacks and a lunch in tow. Remember to bring salty snacks (nuts are great!) to replace that salt (aka electrolytes) that you sweat out. Some prefer Gatorade or other sports drinks for that purpose. Pay attention to the weather app on your phone and know the forecast before you go out. Dress appropriately for the forecast, and even if it is a warm day, it’s a good idea to throw an extra jacket in your backpack. God forbid you go out on a sunny morning only to be caught in an afternoon thunderstorm without a rain jacket. I try to always keep a rain jacket in my backpack at all times. Try to wear layers that are easy to add and remove so that you can adjust to changing conditions. If it’s cold in the morning, wear a sweater with a t-shirt underneath so you aren’t overheating later in the day when you don’t have any other option. Also, wear sturdy shoes. They don’t have to be expensive or even designed for hiking, just avoid slippers or flip-flop sandals. Grab a hat for sun protection, a ball cap or wide-brimmed both work great, and some sunglasses too. Plan out where and how long you will hike, and then tell a friend of family member about it. Let them know when you plan to return, that way if you get stranded, they can get you help. Just be sure to let them know when you return! It’s also a great idea to go hiking with a buddy or group: safety in numbers, baby! Of course, if I didn’t go hiking every time I didn’t have a willing partner, I would almost never go! Don’t let it stop you, just be safe! Follow these simple guidelines and you will be out enjoying nature with the peace of mind that you have what you need to stay safe out in the wilderness. In fact, you will probably be better prepared than more than half of the other hikers on the trail. The last ingredient is having a little common sense, but if you don’t have that already, I don’t know how to help you with that! Hi Jake! Great article. You’ve covered the ten essentials really well. I just recently started using a GPS device because I didn’t want to become reliant on technology that can fail in the field. If you’re in a remote location, there is no replacement for a map & compass if your GPS batteries die, signal drops or the device is damaged. Also, rescuers often report that lost or injured hikers who have managed to find a signal and call 911 will soon lose contact because they have drained their phones while hiking or searching for a signal. If you can move to an actual GPS device and reserve your phone batteries for emergencies, you will be better prepared when things go bad. It’s also great that you noted the importance of carrying matches or a lighter. Just to sure it up a bit, I would add some tinder to your fire kit. It’s not always easy to find fuel to get a fire started, and a little tinder, like wax dipped cotton balls, will go a long way towards helping you start that fire when you need it. Love the site, and always enjoy seeing your photos on IG! Keep it up.